Comey weighed in on Trump, the salacious – and unverified – Russian dossier, and his reason for going public about the probe into Hillary Clinton’s private email server in the final days of the 2016 election. See the top highlights of the interview. Former FBI Director James Comey’s no-holds-barred ABC News interview offered a glimpse of what to read in his coming book “A Higher Loyalty.” ABC News’ chief anchor George Stephanopoulos’ interviewed former FBI director James Comey for a special edition of “20/20” on April 15, 2018. Comey acknowledged that it was “stunning” to think that Russia could have damaging information on a president but said he could not discount the possibility. In the interview Comey also said that President Donald Trump is a dangerous, “morally unfit” leader doing “tremendous damage” to institutional norms. Comey said he believes that Trump is morally unfit for what he calls treating women “like pieces of meat,” lying constantly about matters big and small and insisting that people believe it, and seeing a moral equivalence of demonstrators and counter-protesters in Charlottesville, Virginia. News outlets have obtained copies of Comey’s book before its formal release. In it, Comey wrote that Trump, in a private meeting, pressed the then-FBI director for his loyalty. Comey also weighed in on Trump, the salacious – and unverified – Russian dossier, and his reason for going public about the probe into Hillary Clinton’s private email server in the final days of the 2016 election. In regard to what Sec. Clinton and a large number of Democrats blamed former FBI Director James Comey for her November defeat, he said: “I hope not – but the honest answer is, it wouldn’t have changed the way I think about it,” Comey said. He added he hoped people would read his book, “A Higher Loyalty,” and put themselves in his shoes. Comey claimed he wasn’t trying to favor one candidate over the other but instead tried to do “the right thing,” though he admitted his decision was influenced by the assumption Clinton would beat Trump in the election. One of the enduring images of Comey was captured by television cameras shortly after Trump became president and held a reception at the White House for law enforcement officials. The President calls Comey, who walks across a room to shake the president’s hand, and Trump appears to lean over and almost kiss his cheek. The moment was one of many that Comey describes in which he believes the president is trying to intimidate him into understanding that they are both on the same side, part of the same team. Comey also spoke in the interview about having to confront Trump about allegations against him. “I started to tell him about the allegation was that he had been involved with prostitutes in a hotel in Moscow in 2013,” Comey says in the clip. 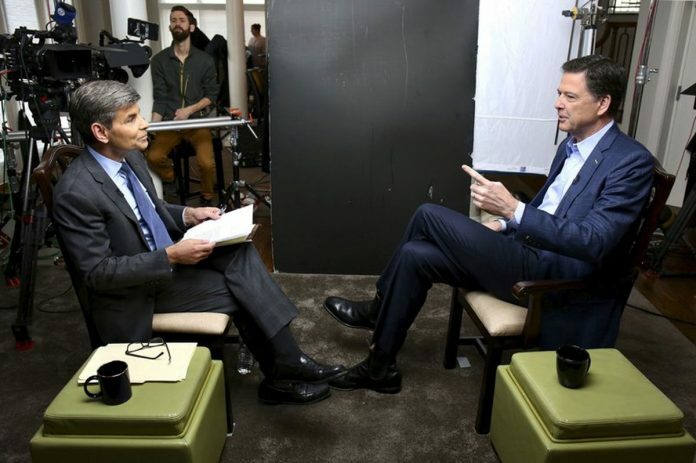 Former FBI Director James Comey’s no-holds-barred ABC News interview offered a glimpse of what to read in his coming book A Higher Loyalty.” ABC News’ chief anchor George Stephanopoulos’ interviewed former FBI director James Comey for a special edition of “20/20” on April 15, 2018.